When we get dressed in the morning, we generally don’t consider the fashion designer’s intention, as this is not part of the conversation when it comes to most garments. Garments are made to function, but in most cases, that’s where it comes to a halt. A tag may provide care information, but rarely does it give insight to the designer’s intent. It may provide fabric content, but not the process, which in the case of smaller run, slow fashion, is just as integral as the ultimate result. The journey is as important as the final destination. On our final instalment of our Statement Fashion spotlight, we look to the Artist Statement as a source of insight to Wendy Van Riesen’s line of sculpture as clothing, better known as Dahlia Drive. “Influenced by a theatre background, I tell stories on recycled textiles. I start with pre used textiles which have their own history: curtain sheers that were once a threshold between the inner and outer world, stains from cut fingers or shared meals , broken threads from loving wear, a slip’s torn lace from years of leg crossing. I shape these materials into canvases for the female form. This landscape inspires me to layer, infuse and embellish a new story onto their map; not to eradicate the previous history, but to stand on its shoulders as part of its evolution. New to its repertoire, Dahlia Drive collaborated with Haida Master Artist Reg Davidson to create a new story telling medium of Haida art called “ Ravens, Eagles, Polka Dots”. The Reg Davidson/Dahlia Drive clothing line is based on the two main clans of Haida lineage: the Raven and the Eagle. Although Davidson has depicted these two moieties in many art forms, they picked the “Raven Dancing” silkscreen and “Eagle Drum” painting. The palette of the line is inspired by the Haida Gwaii landscape and traditional colours used by Haida artists on their carvings: red cedar, red ochre, ash black, and sea foam green. 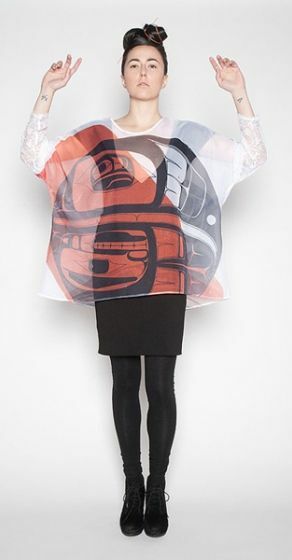 This collaboration was exhibited in 2017 at the inaugural Indigenous Fashion Week in Vancouver. Respect for the environment: The most important value is to conserve waste by transforming what we already have before creating more. Art is affordable: The second-place value is to make art and art design on clothing available to consumers at a reasonable cost. All bodies are beautiful; clothing available in all sizes. Integrity: The fourth-place value indicates Dahlia Drive’s aspiration to create quality fashion that is based on conservation ethics and principles. Vision: The fifth-place value is to print images and textures which reflect the beauty of the human body while implying its intimate connection to the world around it. 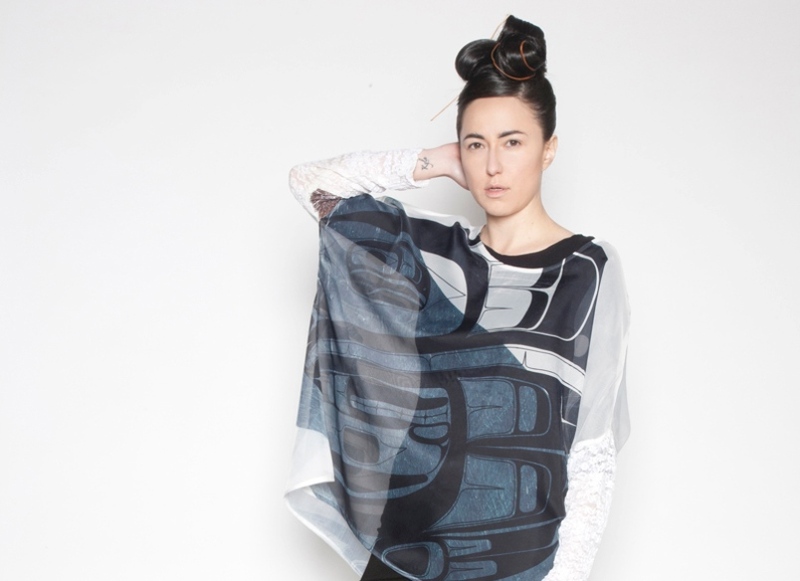 Wendy is a graduate of the Textiles Program from Capilano University and is in pursuit of a Fine Arts Degree from Emily Carr University when not making, exhibiting and selling her collection both across Canada and from her North Vancouver Studio. Find Dahlia Drive at First Pick Handmade this Spring.